A demolition job here for Federer as he crushed Murray 6-0 6-1 in just 56 minutes to book his spot in the Semi Finals at the ATP World Tour Finals in London. The win sees the Swiss top group B with 3 wins from 3 and he's yet to drop a set. Murray came into the encounter needing to win in straight sets to give himself any hope of reaching the knockout stages after losing his opener to Nishikori on Sunday. The World Number 6 did iwin the first two points of the match in Roger's opening service but he was soon down a break and from there Roger never looked back, dominating with his ground strokes and taking advantage of some weak Murray serving to cruise home in front of a shell shocked crowd. Really just a dream performance from him and everything worked seamlessly from the get go. Probably didn't make as many first serves as he would like but his ground game was exceptionally solid and you had a feeling he wasn't likely to miss many shots from the back of the court. All on his terms and that never ends well for an opponent. Roger won the toss and elected to serve. With Murray needing a fast start things looked promising for him at 0-30 but a 35 shot rally ensued that Roger won before going onto hold. Murray's serve has been ropey at best so far this week and Roger was able to break immediately with some majestic play before holding to lead 3-0. In game four Roger then reeled off an exquisite dropshot and then hit an insane inside in forehand winner at 98mph. Whenever those shots lands in you know it's going to a good day, just incredible footwork and racquet head speed to thread the ball into a tight space for a clean winner. The double break was consolidated with a love hold and at 5-0 Roger had won 14 points in a row, a third break then followed as Roger handed Murray his first bagel since the Rogers Cup in 2010 against Monfils. With Murray's hopes of Qualification and Roger guaranteed a spot in the semi's the second set was perhaps even more routine than the first. A love hold started things off and then a double fault by Murray at 30-30 saw him lose serve yet again. By now Fed was in full flight, confidently hitting dropshots and dictating every single point no matter what Murray tried to muster. The relief was short lived for Murray though and despite creating 0-30 on Roger's serve the Swiss stamped his authority yet again to win 4 points in a row to seal it 6-0 6-1. I had the upper hand from the baseline, which hasn't always happened against him. But I definitely was able to play on my terms. For me, things went very well. I was able to put Andy under pressure very often, and I think the match couldn't have gone any better for me really. A majestic performance here from Roger and one of those matches where everything he tries works peRFectly. Dropshots, volleys, angles, the forehand, it all clicked together and flowed effortlessly from the first ball to the last. Some of his point construction is just epic when he's playing purely on insinct, running Murray around like someone who has never played before. This wasn't a match full of blasting winners or serving his opponent of the court either and I saw a few fans on Facebook say the stats aren't that great. However stats never paint the full picture and this one was all down to point construction and keeping his opponent under constant pressure. Like Fed said he knew early it was one of those days where Murray wasn't able to hurt him from the baseline; that allowed him to take charge and play completely on his terms. When that happen there's just now way back in against an opponent like Roger. Clearly it wasn't Murray's best tennis day but he wasn't allowed to get comfortable at the back of the court. Roger's semi final opponent is Wawrinka who qualified after beating Cilic in 3 sets. Quite a tough match for him and based on what I have seen Fed wins this one in straights. Stan has a huge game but on this surface so far he's struggled to really piece things together and I don't see how he can hurt Roger enough to really cause a problem. Fed in 2. 6-2 6-4. Allez! Highly impressive performance from Roger here who was at his brilliant free flowing best throughout. Untouchable! Thanks! Honestly a bit shocked how bad Murray played. Did not expected that from a former GS champ. The same goes to Cilic and Stan, its pure horrible tennis from 3 of them. This kind of performance makes you appreciate Roger a lot more. Those Roger haters needs to understand tennis a lot more. It is very tough! You have the off season to work on your game. Hey girls! On podium again! If he isn’t the GOAT, who is? Such a joy to watch when he plays like that. Full of magic, God like athleticism, power hitting, smart tactics, despite the joke 1st serve in% (!) which made this match of masterclass even more incredible! He showed the world how tennis should be played. Glad I’m not a Murray’s fan out there last night. Utter misery for them. Sorry, but we had a great fun! Roger is 19-1 in 2014 when he serves >60%. Nice stat, didn’t know that. I’ve been thinking about this whole 1st serve % thing. Yes, it’s abysmally low – BUT serving at 39% and making 100% of those points is roughly equivalent to serving at 64% and making 61% of those points. So… as always, and as Jonathan & others are continually reminding us, context makes a huge difference. Serving aces on this surface is very difficult so not really a concern for me. lol Sid – I’m thinking ” ‘Twas brillig, and the slithy toves did gyre & gimble in the wabe” has got to fit in here somewhere. “…. and hast though SLAIN the JABBERWOCK! The Jabberwocky returns in January 2015, fully regenerated. Will Novak be able to slay him? That would be frabjoulous! And if that were to happen, I’ll surely futterwacken, vigorously. Haven’t seen the Tsonga quote, when was he interviewed? It’s an old Tsonga quote, from RF & friends in Jan earlier this year, in Oz. It was much commented on at the time – you can actually google the phrase “he’s so shiny”…. Riiight, I BET you’ve never heard of our Alice! He hasn’t heard of our Alice? Off with his head! Wow, did you guys hear what Mourinho had to say even before the first set was over? He literally gave up on Murray, lol. GOSH!!! Today is the day we either concede the Number 1 or have some hopes towards it. Why or why STAN?!!! Exactly! I haven’t slept all night, just couldn’t. Kept getting up again, and again, in the middle of the night, thinking about how the Djokovic-Berdych match will go. I mean, we could lose it all! All the matches I’ve watched Roger play this year, all the comments I’ve read on this blog, and the comments that I’ve posted, it all comes down to today. Yes, today is indeed the Day of Days. 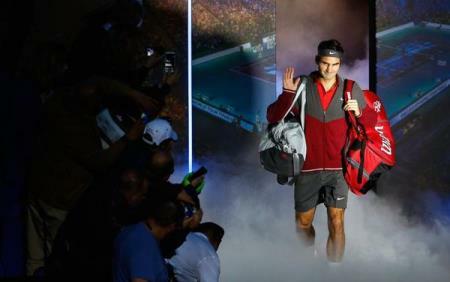 The eyes of the world are upon Roger Federer and his fans. Be prepared! And that Stan the man is a total idiot. He had this one great opportunity to help out his Swiss compatriot regain the No.1 ranking, and he blew it. It seems to me all players have been struggling to get first serves in, or have I got that wrong? Importantly, Federer’s solid (and tricky) second serve always stands him in good stead. Murray didn’t play great but much of that was down to Feds’ brilliance. Poor Murray looked totally bamboozled out there, as shots whizzed past him from every direction. I’m sure Feds took pity on him in the end and let him have one game. 🙂 I did feel sorry for Murray, how could you not? A very humiliating defeat. There still the WTF trophy though and that would be a wonderful consolation prize. If Feds can pick up that 1st serve % (which he needs to do against Djoko) and get himself a good few free points, and play with the relaxed confidence he has displayed in all his matches (particularly last two), I believe he has a very good chance indeed. Go champ! Brilliant performance from Roger. Some of those points were worth the price of the ticket alone. I must say I felt a wee bit sorry for Andy who looked utterly clueless. He really needs to take a good look at his coaching arrangement I think. Such a shame about Paris! Unfortunately, slamdunk, I don’t have enough broadband to make streaming an option, so it’s the radio for me. Again :(. Sorry, Stan, I’m very fond of you, but I desperately want a decent final tomorrow, not a whitewash. Wonder if Mauresmo will be there next year? This Murraysmo thing was never going go anywhere. She hasn’t done too badly I think – look at all his hard work to make it to the WTF in the first place. He just ran out of gas. Okay *WHITE FLAG*, we concede Number 1 this year. Djoker definitely deserved it, considering he shaded on tournaments won including all the top end ones. And in his current form, were in for a good final. Problem is, this court really emphasises the slightest difference in level. Yeah Djoker won Wimbledon, hard to argue that he’s not the #1 player in the world right now, but it’s definitely close between him and Fed. LOL @ Sid, I love you. Need some Fed medicine. Djokovic might be the one most likely to surpass Fed’s record of YE Number 1 if the young guns refuse to step up. SuperFed! Wonderful to watch. Total GOAT! His shot variety was so special, wld love to get a count on how many different shots he displays over the course of a match like that! Huge! Muzza had just 2, new loopy FH ( where has that come from?) and tentative BH. He had no stratagems, no clue and was totally outplayed. Inevitable All Swiss semi, but despite the DC Fed wants this title big time as hasn’t got no 1 ( not that that was ever on his racquet). I am gunning for Kei to produce a sensation on Saturday or at least exhaust Novak and Fed to win Sunday!! Plse! It is Christmas!! Oh me too Susie. Kei knows he can do it (and on the big stage). I thought in the third set against Ferrer that his shot-making improved (although it was mentioned that Ferrer had a lower back problem). One of the commies mentioned that sometimes (if it’s a tendon problem), it ‘warms up’ and starts to feel better as you use it. Hope this is the case and he can push Djoko, if not beat him. Man, those communists sure know their stuff. Tough for Kei vs Djoker I think but if he can own the baseline then he has a shot seen as though he’s better in offence than Djoker and can hurt him. Call me crazy or what. Watched this match 2x now. Love the shot making and foot work. Roger seems to be more at home with the new racket. That to me is a huge difference to his great form of late. Such confidence in all his shots. The year end #1 could have been his if Roger had won a few more of those finals earlier in the year. Think Wimbledon 5th set like Sid said. We are so lucky to see our man play such magical tennis. You’re not crazy Sue – I watched it twice also. When Federer’s playing like that, you want to watch it over and over. 🙂 Even though Murray’s inability to put up any sort of challenge was excruciating. I just watch the highlights, all the best shots rolled into one 🙂 Hit some immense ground strokes through, rock solid from the back of the court too. Hey Sue, me too. Never get tired of watching JesusFed! WHAT A SHOW!! Poor Murray! He had to face the groundstrokes of GOAT in full flow. Absolutely out of idea. Standing like a hanged computer. GOAT’s poor 1st serve % also proves the quality of his shots today. Go ROGER! Interested to see what Djoker does if he repeats this! I know, just what do he and his coach talk about after these defeats because nothing ever changes! When it’s lagging and running too many processes so hangs up and then catches up. Like Murray playing reactive tennis. What a wonderful masterclass of tennis – just imagine if Fed’s serve was in the 60% region – it would have been a really short match. I think he actually felt a bit bad about winning so easily -do not feel bad Fed just go out there and blow your opponents off the court!! Couldn’t believe what I watched tbh! Was anyone hysterically laughing at what was unfolding? Cos I sure was! 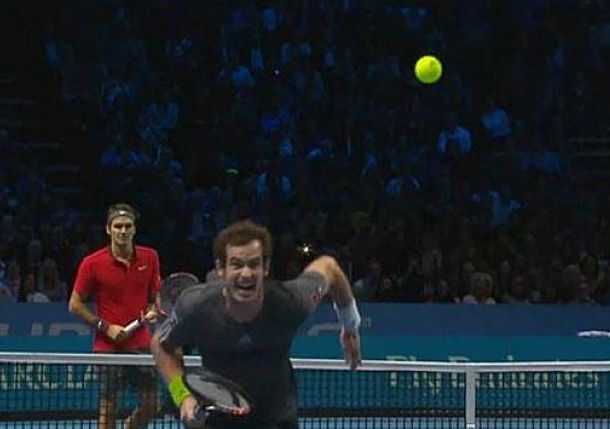 Murray was completely and utterly THUMPED. Oh the joys of being a Fed fan, such a satisfying win! And Federer was itching to bury him even in that penultimate game…come on, who’s he trying to kid by saying he’s ‘glad’ he didn’t win it. But damn it I wanted that double bagel! Had him on the ropes as well at 5-0, 0-30 up, a make-able volley would have brought up match points.. Hahaha the match is bringing out my inner sadist. Complete win-win for me. 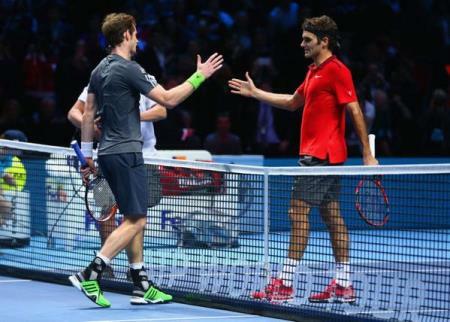 Fed in imperious form, and Murray in the doldrums. Hopefully this beat-down will stem all this rubbish talk of Murray ‘getting back to his best’. Please British Media – take several seats! He beat bloody veterans in Ferrer and Robredo, and suddenly everyone is GASSED. Yesterday he was utterly out-classed, whoever still thinks he’s still in the same league as Federer, Nadal and Djokovic needs a brain scan. I’ve watched it 3 times!! Utter joy! Watched it twice, but I have a feeling int eh long winter nights when there is no tennis it will be watched a few more times!!!!!!!! The only people who put Murray in the greatness category are the British media. He’s clearly the most talented British player of the last however long but still not really close to Fed, Nadal, Djoker, Sampras, Agassi etc. I mean would you say he’s had a better career than Hewitt, Roddick, Ferrero, Rafter etc? I think it is debatable. I’d place him in that sort of category I think, perhaps just slightly above as he has won more Masters 1000 titles. I can’t think of many other venues that could host it? It has to be in Europe really due to TV money and Sky. Definitely can’t be in USA / SA or Asia. Maybe he is hoping it will go to Serbia – it’s the only place he would get a bigger cheer when he walks on court than Fed!!!!! This is a great presser. Fed is so empathetic about Andy and it seems pretty genuine. Fed talking about double bagel and most importantly to the press…asking for positive feedback about the tournament. Haha some of the matches involving Berdscat and Cilic have been terrible though 🙂 although I heard doubles has been quite good. I’ve watched a couple of the doubles matches – especially Dodig/Melo – Dodig in particular has played some wonderful tennis and produced some great shots – very entertaining. And I’ve always loved the Bryans. Have to say that (apart from Fed matches of course), they have been far more enjoyable. Couldn’t help but share this photo. That was the shot were Peter Fleming said: ‘I’ll just drop that one there, now off you go’ 🙂 Poor Murray, Federer really did have him on a string didn’t he? There were balls whizzing past him in all directions, poor lad. THIS is the one that you guys were bouncing back & forth on Twitter, that was such an encapsulation of the match. Roger: I think I’ll just stand here for a minute. Andy: GAAAHHHH! Must chase down this ball! A very short but cutest of the cute ones! Lovely isn’t it!!!!! They seem to be a playful family, they just love games and plays; so cool! By the way, did anyone notice that Roger got a cheer in the 2nd set when he double faulted?? The commies didn’t say anything about it. But when it happened to Karlovic in Basel, they were like.. wow look at how bad the Basel crowd is… double standard much?? I think Kei has a good chance of beating Novak, but his wrist??? On your last sentence Katyani – that would be so bloody typical wouldn’t it? But I really don’t think it’s going to happen. On Kei, if the wrist holds up, he has the weapons – but it doesn’t look that likely. PS: agree on Kim’s sweater – I thought it was ghastly. Man, I’m so so so much with you on that one… Should he remember he can play great, where he should have done it against Novak. Seriously!!!! Seriously!!!!!!! I really don’t want it to happen like that. Ahem. You were saying, Katyani? I think I’ve only just about stopped shaking. We have contests in Canada for the ugliest Christmas sweater. Nishikori blew it in the start of the 3rd. Oh well, no surprises. What a match. Federer was playing almost Nadal like. Baiting the errors and saving match points !! As much as I think the long slog reduces rovers chances in the final tomorrow, this match is certainly one to remember with fondness. Poor Stan, though – so unfair that someone has to lose. Have you not tried http://www.drakulastream.eu/tennis-live-streaming-video.html Alison? It is free. Sorry about the repeat Alison, I didn’t think you’d seen it. I’m down in the SW so I know about bad download speed; had to go back to BT because it was so poor. BBC are crap: what’s the point of just showing afternoon match? The best match of the tournament so far. OMG. Roger was determined to win. I hope he will have the energy tomorrow to take on the smug one. A match to remember for sure. Federer showed once again his fighting spirit – unbelievable – but I am worried about that back. Wow, just finished watching and reading about the match. Well played Roger! P.S. Sedatives and a defibrilator anyone? My partner was telling me to calm down – I was actually shaking…I don’t know how Mirka sits there, mostly so calm. But she wasn’t last night I noticed – there was a lot of emotion. Oh, alert for those of you in the UK! Radio 5 Live were saying there would be some sort of tennis special on tomorrow afternoon (was it 3.30-4.30? I was still shaking too much to pay much attention) with interviews with Fed and Edberg. Does anyone have time to check before then? I’m glad Stan did not manage to sneak out a win against Roger on his off day. He would have surely lost 6-2 6-0 to Djoker. Hope Roger has enough left in the tank to take it to Djoker and win it tomorrow. He has to serve and return better tomorrow. Hope we will see an awesome match with Roger holding the trophy at the end. Stan might drop out of top 10 after failing to defend his AusOpen title. Not going to feel bad for him at all. Can’t believe he was trying to hit Roger at the net more than once. Hmm. The back again. Sure hope not. My money’s on Djoker. He’s had a good rest before the final. Why do they always put Roger on night matches. Sadly Sue, I have to agree with you. To be honest though, I’m now more concerned that Rog will really aggravate his back even more. Roger’s the biggest draw, tournament directors know this: it is rather unfair…I wonder what time he actually got to bed last night? I do hope his physio is able to work some magic on his back. It’s easy to forget just how many matches he’s played this year – more than anyone in the top ten certainly – and this has got to catch up in the end. Even he has admitted that he can’t recover as quickly as he used to. Oh God, just so long as it’s not a beat down for our guy – it’s incredible what he’s able to produce time and time again – and he’s a stubborn man, so I’ve got everything crossed for him. I went through the replays and I couldn’t find any sign of grimace or tightness in the back/ movement. Don’t think it’s a problem. And boy did you get your prediction off the mark this time Jonathan!! You didn’t Gaurav? Well I truly hope I’m wrong. Perhaps I was imagining it…just thought I saw something on that very last point, and the way he was returning his racquet to his bag – he was leaning very awkwardly. Judging by the way Stan had played throughout the tournament, I think we were all expecting a relatively straightforward match. But let’s not forget that Stan has ambitions too: why should he not have a stab at WTF trophy? And he very nearly did!